"I had never made prime rib before, but this slow-roasted recipe is so easy. 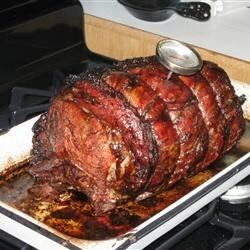 It originated from my mother-in-law who makes prime rib often; with a lot of research, I have made a few changes and prefer my recipe with the alterations." Mix liquid seasoning and Worcestershire sauce together with garlic in a bowl. Pour over prime rib in a container. Marinate, turning every 30 minutes, 1 to 2 hours. Place prime rib on a baking rack set inside a large baking dish. Bake in the preheated oven until all juices are sealed in, about 45 minutes. Reduce temperature to 325 degrees F (165 degrees C) and continue roasting until an instant-read thermometer inserted into the center reads 130 to 140 degrees F (54 to 60 degrees C), about 2 hours more. Let sit 30 minutes to 1 hour before slicing. 30 minutes per pound = medium internal temp should be 130 to 140 degrees F (54 to 50 degrees C). Make sure to add water to the bottom of the baking dish so that the drippings do not burn during cook time. Feel free to use the drippings to make a sauce/gravy.